Dressing – The process of exposing new abrasive grain and new sharp cutting edges. Truing – The process of forming the working face of the grinding wheel so that it is concentric to the axis of the grinding wheel. Diamond dressers are a diamond tipped tool used for truing and dressing grinding wheels. Diamond dressers have either a single or multiple diamonds bonded to the tip of the shank. Centric offers both threaded and smooth diamond dresser. Centric Inc. has several options for our customers when it comes to diamond dressers. We can offer a single point diamond dresser or a cluster diamond dresser. The single point diamond dressers utilize a single diamond between .25 - .35 carat. Our cluster diamond dresser contains several smaller diamonds that gives the dresser a greater coverage of grinding area. Having trouble finding a replacement diamond dresser for your SCM/SCMI grinder? 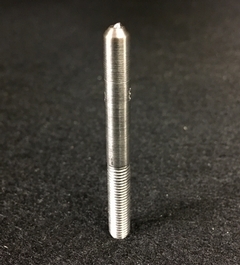 Centric has your solution; diamond dressers with a ¼” thread are available at Centric Inc.
For more information on diamond dressers or any of the many other products that Centric Inc. offers please call us at 715-848-4242 or visit us on the web at www.centrictool.com.